Any money should go to the women themselves, James Reilly told the Dáil today. 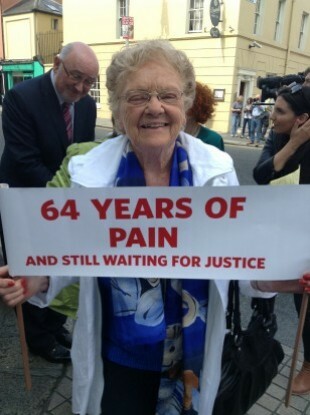 Margaret Dutton, 91, at a protest outside Leinster House earlier this year. MINISTER JAMES REILLY has told the Dáil that he wants to see any money exchanged in the settlement of the symphysiotomy scandal to go to the women impacted – and not legal firms. Speaking this afternoon, he said he wanted to bring closure to the issue “with the least possible pain” to the survivors. Sinn Féin’s Caoimhghín Ó Caoláin, who raised the issue during today’s session in the chamber, noted that the two legal firms involved with the victims were “quite willing and enthusiastic” about negotiating a settlement agreeable to all parties. The Minister noted that any arrangement reached by the government will still allow the women to take the matter to court, if they so wish. He has asked the Attorney General to approach a judge who could examine the issue and bring detailed proposals to government. However, he said that the number of suitable people is limited as High Court judges cannot be approached as they may have to hear cases in the future. Advocacy group, Survivors of Symphysiotomy, reiterated today that a ‘negotiated settlement’ is the preferred solution for those they represent. She claims that clinical reports show that the vast majority of the procedures, which involve breaking or widening the pelvis during – or, in some cases, after – childbirth, were planned. Reilly has conceded that the surgeries were carried out in Ireland “long after” they were discontinued in other countries. Email “Minister does not want legal firms to benefit from symphysiotomy settlement”. Feedback on “Minister does not want legal firms to benefit from symphysiotomy settlement”.